As if you needed another reason to crack a cold one! For years now, health nuts have preached about increased risks related to indulging in one’s favourite brew. However, research has revealed that moderate drinking provides more medical benefits than marrying a doctor! In fact, beer has been known for defending against cardiac disease, preventing Alzheimer’s, avoiding diabetes and chemopreventing cancer. So the next time you’re planning to pour a pint, remember these hints by Luke McKinney from Chill Magazine and enjoy your brew guilt-free! · Defending against cardiac disease – A review of 60 years of data on the cardiac effects of alcohol, found that men enjoying two drinks a day, and women enjoying one are around 20 percent less likely to develop heart disease. But be warned: beer only reduces your risk of physical heart problems. It has the opposite effect on the emotional kind. · Preventing Alzheimer’s - If you think those who don’t enjoy cold beer on a hot summer day are in the wrong, you’re right. Studies have shown that seniors who still drink regularly had a lower chance of developing dementia. In fact, research also shows that the average, moderate beer drinker has stronger mental health with more friends, better education and less depression than non-drinkers. · Avoiding diabetes - A study of over thirty-five thousand people for a decade demonstrated that moderate drinking reduces the risk of diabetes by about 40 percent. This even applies to completely healthy people. Moderate drinking tinkers with your hormone levels, reduces inflammation factors in the blood and even alters the gene expression of white blood cells. So the next time a couple of cold beers improve your view of the world, remember that they’re improving your ability to survive it too. 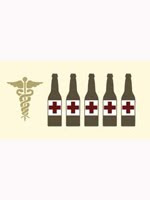 · Chemopreventing cancer – A joint study found that rats fed on beer were significantly less vulnerable to cancer. The beer actually prevented DNA damage. They found that water or a five percent ethanol solution didn’t have the same benefits, so it’s not just alcohol: it has to be beer. Apparently the glorious chemicals that give beer its flavour want to keep you around longer to enjoy it!